Peace under the new Cyrus (Donald Trump)? Trump’s peace plan for Israel will be revealed in September shortly after the Jewish New Year and the Day of Atonement fast, which happens in the 70 th year of Israel’s existence. 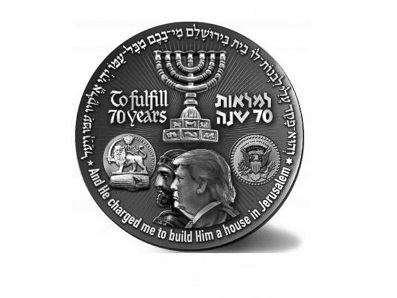 Third Temple fanatics have already pointed out that Donald Trump has a name with the same gematria value as “Messiah of the house of David” (see previous posts) and declaring him the “new Cyrus”. This is a repeat pattern. The Jews did the same when they approached Cyrus and showed him that their scripture predicted an early return and rebuilding of the temple. The pagan “Cyrus” was the “Messiah” now it is Donald Trump. So, on all scriptural metrics the prophecy fails (if it refers to Cyrus). The Jews are doing what they always have done when they act unfaithfully – they use scripture to flatter and manipulate Gentile rulers. Some of the people pushing the agenda are Knesset Mp’s. labour and sorrow; for it is soon cut off, and we fly away"
Perhaps the next ten years will be "labour and sorrow"? Report: 'Deal of the Century' to be unveiled next month PA newspaper reports Trump peace plan to be unveiled during president's speech to UN General Assembly in September.